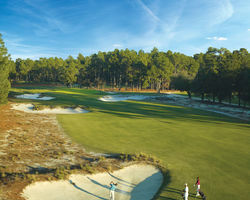 Looking for Package Deals to Pinehurst? We have those too! We suggest you combine a mix of old and new, short and long courses into your next stay, and find the fine nuances in all of them. More importantly, you'll walk where legends have for centuries, and make your own mark as well. And the region's four distinct, yet mild, seasons permit year-round play. 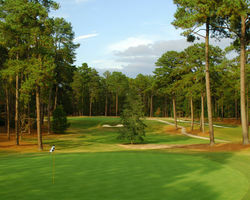 YOU MUST STAY AT THE PINEHURST RESORT TO PLAY THIS COURSE This is where it all began. Even though Dr. Leroy Culver built the first rudimentary nine holes and John Dunn Tucker added the next nine, it is clearly Donald Ross' touch that can be seen on this first golf course. Don't let the short 6,128-yard par 70 fool you - it's more of a course than it first appears. Wild drives or a sloppy short game can make for a long day. As with any course bearing Ross' name, it is ultimately very playable without losing its challenge. The best of the best. No. 2 is a challenge not because of its length, topography, unruly routing, water features or green size - but because of the combination of factors that have made thousands laugh and cry at the same time. Undulating greens. Carefully placed bunkers. Strategic layout that tests both the long and short game. It is golf the way it was meant to be played, "the fairest test of championship golf" ever designed by Ross, in his own words. Pinehurst No. 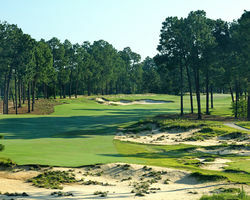 2, the centerpiece of Pinehurst Resort, remains one of the world's most celebrated golf courses. It has served as the site of more single golf championships than any course in America and, in 2014, hosted 14 days of championship play with back to back U.S. Open and U.S. Women' Open Championships for the first time in their history. YOU MUST STAY AT THE PINEHURST RESORT TO PLAY THIS COURSE At 5,682 yards, distance is not a factor on No. 3. Direction is. Your short game -- definitely a factor. The topography is a bit more rolling than its predecessors are, but it still carries typical Ross characteristics, such as tricky greens and straightforward layout. A great course for those who normally carry the ball less than 200 yards and who love the science behind a perfect nine-iron shot. No. 4, completely redesigned by renowned golf course architect Gil Hanse. Visually stunning from tee to green, exposed sand areas, vast cross bunkers and native wire grass meld with the site’s rolling topography and natural ridge lines to create dramatic vistas and strategic options on every hole. “We believe golfers are going to appreciate how No. 4 fits into the Pinehurst lineup and elevates the entire golf experience,” says Hanse, architect of the 2016 Olympic Course in Rio de Janeiro. The USGA has already named No. 4, along with No. 2, as co-hosts for the 2019 U.S. Amateur Championship. It marks the third time the prestigious event will be played at Pinehurst and the first since 2008.